Blackberry jam or blackberry coulis? The comparative test we carried out at the Wimbledon Common Stables Open Day in September provided us with cheerful evidence of taste bud satisfaction. Abundance Wimbledon were invited to run a stall at the annual Stables Open Day next to the Wimbledon & Putney Common windmill on Sunday 15th September 2013. I took the opportunity to organise a comparative tasting of two products I had made from fruit foraged on the Commons the week before. 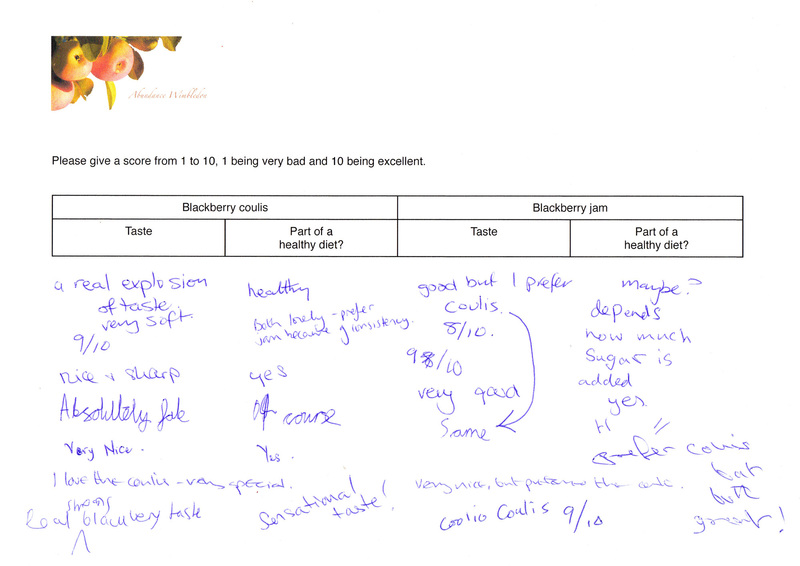 Visitors to the stall were invited to taste a “blackberry jam” and a “blackberry coulis”, to give a score from 1 to 10 to each of them, 1 being “very bad” and 10 being “excellent”, and to write their comments on two dimensions: “taste” and “part of a healthy diet?”. Overall… “Coolio Coulis”, “Absolutely fab”, “Sensational taste” and “Yes” it is healthy, comments on this attribute going from “Maybe, depends on how much sugar is added” to “Of course”. Some preferred the jam because of the consistency, yet the coulis was a clear winner! The two jars on the right are the blackberry jam and coulis. 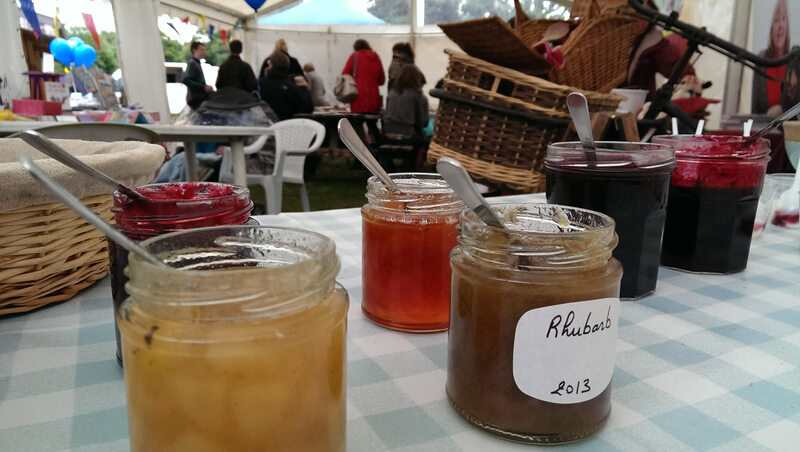 We also had other jams to taste, made with fruit picked in Wimbledon and Southfields gardens: rhubarb, pear, Victoria plum and damson. Photo Tim Keates, Stables Open Day, 15th Sep 2013. So, what was the difference between the blackberry jam and the blackberry coulis? In fact there was little difference: the coulis was not a real coulis, it was just a jam that had not set. I had made two batches, one cooked for only ten minutes, the minimum cooking time for a blackberry jam, as the fruit contains little pectin, and one where I had added 10% of apple puree and which I cooked for twenty minutes. Apples being rich in pectin, it helped the jam set, and the result was indeed a very set jam. Blackberry jam sometimes sets well, sometimes not. It depends on the fruit, at what ripening stage the blackberries were picked and in what weather, what was the weather like during the summer… Many different factors come into play, and despite the fact that I have been making blackberry jam for many years, obtaining the right consistency – I like it not too hard so I avoid adding too much pectin elements – remains a gamble for me. But to me it does not matter. If the jam is runny, it usually feels tastier, and goes very well with plain yoghurt. If it is well set, it’s easier to spread cleanly on a toast. Both are good! On the down side, with runny jam there is more of a chance that mould will develop on the surface overtime. Let’s not forget that this is home-made production and that this sort of inconvenience, although not frequent, may happen even when the jars were boiled or heated in the oven. What I tend to do is eat runny jams first, let’s say in the six months following production, even if in most cases they could keep for at least two years. If there is some mould on top of the jar I have just opened, which, again, seldom happens, I just remove up to half a centimeter of the jam and eat the rest. If I noticed any alcoholic smell, a sign of fermentation, I would just throw the jam away. Yet this has not happened to me in many years… And it is not because we eat the jam too quickly! And last but not least: consistency may change overtime. For instance the coulis we offered for tasting at the Wimbledon Stables a week after producing it, thickened in the following weeks, and it now has almost the consistency of a normal jam. As I said above, the coulis was in fact a jam that had not set. The same quantity of sugar was used in both batches, and no water was added. Cooking time: coulis 10 minutes from boiling point. Jam: 20 minutes, yet ten to fifteen minutes could have been enough, I just wanted a clear difference of consistency between the jam and the coulis. How to check setting point: see ‘Redcurrant and raspberry jam’. 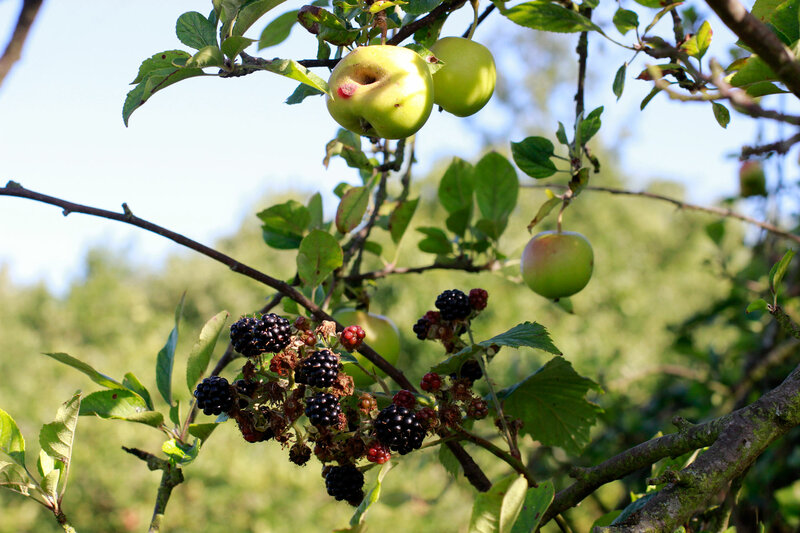 Various varieties of fruit can be foraged on the Commons, and picking them is allowed. Having said that, as an experienced forager I went in the most remote parts of the commons to pick the blackberries and the few apples I used for this recipe. I just think that we need to be considerate of everyone’s needs, pick reasonable quantities and leave the most accessible spots for families and people who don’t necessarily wear appropriate equipment such as wellies to go into more difficult areas. Wild fruit is a limited resource, which should stay accessible to all! Fruit used for the blackberry jam and blackberry coulis. Photo September 2013, Wimbledon & Putney Commons. This entry was posted in Eat, Events, Stories and tagged Blackberries, Putney, UK, Wimbledon by Les Jardins d'ici. Bookmark the permalink.